Ribbons of color, swaths that define a horizon, a jumble of hues, and silken strings of a well threaded theme. It most certainly sounds like your run of the mill description of a painting done in acrylic or oil. However, this can be said literally of the multimedia work that Vadis Turner exhibited for her new show Past Perfection at the new space of Jack Geary Contemporary last September 26th. 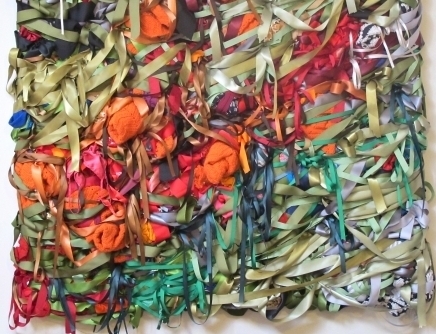 Turner fabricated her paintings using ribbon, fabric strips, cord and various materials to create a landscape or vistas that is tactile as opposed to a flat rendering by paint. It makes her carefully executed and plotted studies move into a fresher direction. For every component woven, tied or interlaced – it contributes to a substantiated whole that demonstrates the subtle yet definitive process of the artist. The large-scale pieces gave a dramatic and luxurious impact that one can surely make out either Daybreak (2013) or Swamp (2013) from the lush quality of her work. Breaking from the constraints of conventional paintings done with acrylic paint, Turner has pushed into a more nuanced way of expressing dynamic movement and rich multi-layered textures by doing mixed media. In a way, she has gone back to painting verdant landscapes, menacing stormy skies, murky swamps and the radiant light of day but the brush has been replaced with her deft hands manipulating the strips and strings of material. She paints with fabric the way a master painter such as a classical Titian or Impressionistic Monet can indicate depth and drama. These are not random acts of crafting as one might deduce since it’s just an assemblage of fabric looped and weaved together. It is with deliberate and precise plotting in the use or manipulation of the fabrics that Turner emulates her studies of a scene that is once familiar yet in a newer perspective. One is enticed to spend a chunk of their time to consider every strip as to create a visual that is tactile but very much studied. Vadis Turner has fabricated worlds and scenes that are indeed past perfection. With the material use of fabric and ribbon that it’s a sartorial take on what can be produced to make art. Perfection is not rooted in rigid self-containing rules of the absolute but in the looseness of ideas executed effortlessly. This is what Turner has achieved with her latest works. Sheer perfection is achieved when you infuse passion into the fabrication of your art.